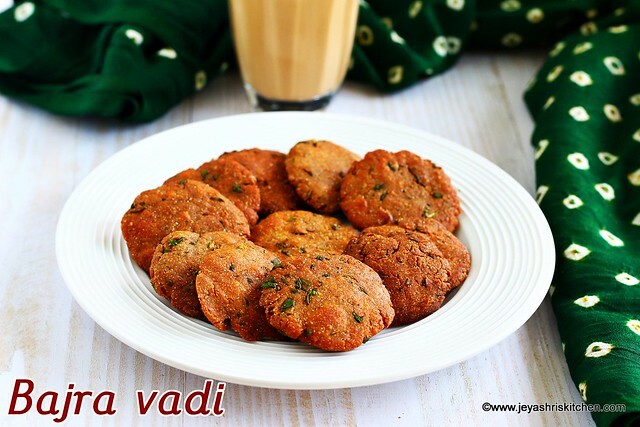 Bajra vadi , a tea time snack made using Bajra flour and other spices. Bajra ni wadi is a traditional Gujarati snack, which i recently learnt from a friend who visited us. I am a huge fan of Gujarati and Maharastrian cuisine. Though i have not explored much in trying out gujarati recipes but whenever i come across the recipes i feel like eating them. This bajra vadi i have seen many times in various blogs and always wanted to give it a try. Recently our friend, who are gujaratis, visited us, i asked her few gujarati recipes and this bajra vadi is one among them. Finally i tried this yesterday and it turned out yum. The taste was similar to bakarwadi and matri. Thank you so much Heena for the recipe. Try this tea time snack using bajra flour | kambu maavu| pearl millet flour and let me know how it turned out. In a wide bowl add the methi leaves, red chili powder, coriander powder,cumin powder, salt, garam masala and ajwain seeds. Mix well and keep this aside for 10 minutes. Add the bajra flour and the atta to this. Add 1 tblsp hot oil. This gives crispiness to the bajra vadi. Mix well and sprinkle water little by little to make a tight dough. Cover and keep it aside for 10 minutes. This is optional. You can make the vadis immediately too. Make equal lemon sized balls with the dough. Using your fingers make it flat and just expand it to form a small disc. Once it is hot, bring the flame to medium. Add the vadis in batches. Fry in medium for a minute. Keep the flame low. Fry this till it gets nice brown colour and crisp. Take out and drain in a kitchen towel. Repeat this for the rest of the vadis. Once they are cool, store in an air tight container. This can be stored for 4-5 days in a dry container. Red chili powder can be replaced with green chili paste. Crushed fennel seeds can be added to dough. Do not cook in a high flame as it will make it too soft and can not be stored for a long time too.